Take the chore out of at-home pedicures with Emjoi® MicroPedi. 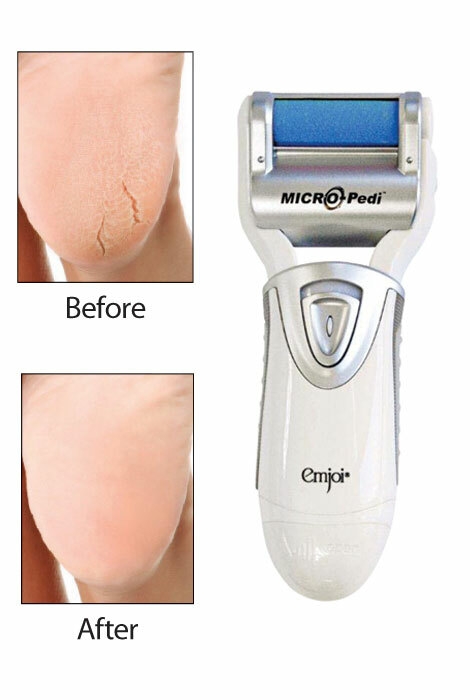 Just roll this Emjoi® callus remover over skin to buff away hardened skin in seconds. This callus removal tool works hard, but is gentle on skin. Convenient and easy-to-use. Uses 2 AA batteries (not included). BEST - A LADIES MUST HAVE!!!! COME ON LADIES!! WHAT'S KEEPING YOU FROM TRYING THIS FAB PRODUCT? hUBBY GOT ME FOR A STOCKING STUFFER...I GET A PEDI EVERY 2-3 WEEKS...AND YOU ALL KNOW YOU REALLY NEED ONE BY THEN. NOW, MY FEET LOOK GREAT EVERY SINGLE WEEK AND GIVE CREDIT TO MY HUBBY!! SO LIGHTWEIGHT AND EZ TO USE. AFTER SHOWER WHILE WATCHING TV....FAST AND REALLY WORKS. GET INVITED TO A PARTY OR SURPRISE DINNER....NO WORRIES. TAKES FEW MINUTES AND ADD LOTION AND YOU HAVE BEAUTFUL SMOOTH FEET. I GOT ONE FOR ALL MY FRIENDS, THAT'S HOW MUCH I LOVE THIS. NOW, GO ON AND ORDER YOURS....NOW, GO ON - GO. AND DON'T FORGET TO WRITE YOUR REVIEW!! I love it. It work just how it was described. The product isn't complicated easy instructions the heavy sander was best for me. I received one for my birthday and like it. Sending one to my daughter-in-law for her special day. I have tough calluses on inside of big toe and ball of foot. Hope this takes care of the problem. I have been watching this item on tv and I want to try it. Would like to try; getting feet ready for spring. I read the other reviews and seems like this one might actually work...i will let you know when i receive it. My heels need help! I like to go barefooted and have smooth feet too. Looking forward to using this product. Laterâ?¦I have been using this product and notices a big difference in my feet and heels. So glad I purchased the emjoi micropedi. I am very particular as to how smooth my feet stay and this product would make it a lot easier. I've seen it advertised and wanted to try it. I have one now and it is getting old.......like it so decided to buy new one. I have a calus on the bottom of my foot do to several surgeries, I find this to help make them flat so I can wear heels, This product is great for this. I have problems with callus on bottom of feet. This Micro Pedi works terrific. 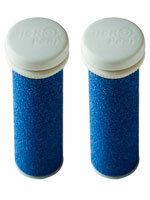 Do you have additional (more abbrasive) replacement rolls? NO NEED TO PAY A PROFESSIONAL, HIGH QUALITY WITH OUT THE HIGH PRICE. EVEN MY HUSBAND LIKES THE WAY IT MAKES HIS FEET FEEL. Am senior citizen and believe this will help me to keep my feet smooth. For the rough skin on my heels. ads. Really like using it. my feet are like a horses...... help! I have very dry feet and saw ads on tv. wanted to try something better than the manual. Looked like the best quality of the ones I had seen. I spend much too much time scraping with pumice, etc. It drives my family nuts, so I do it less often and wear soft socks. What a pain then dressing up or in the warm wether. Also I don;'t have the shoulder strength for that business any more. This product promised to save time and get more tough skin off for the money and time spent. Are additional rollers available for sale? BEST ANSWER: Thank you for your question. 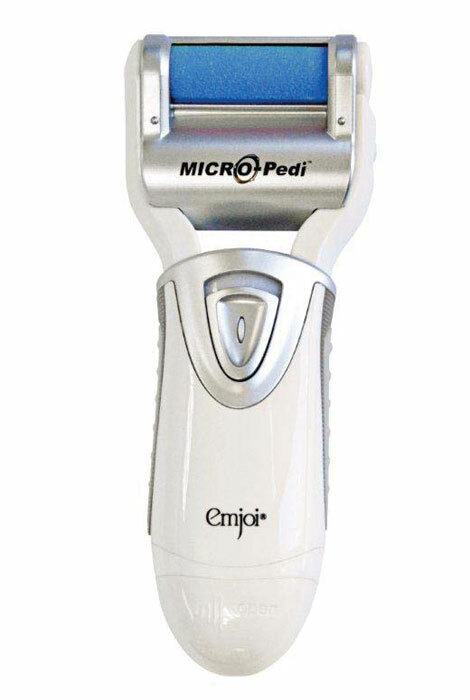 At this time we do not sell additional rollers for the Emjoi MicroPedi. We hope this will be of help to you and we apologize for any inconvenience. BEST ANSWER: Thank you for your question. This item is run with 2 AA batteries. We hope this information will be of help to you. BEST ANSWER: Seems like forever, and I put them to the test. Horrible callouses. I have had mine for years and never had to replacevthem. I recommend the product highly.